One of the first questions consumers are wired to ask when doing their research, is what makes one product superior to another? The same thoughts should go towards building materials. What would make you choose one over the other? The answer should be simple, the product that can save you money and time, and is a superior option should win out every time. 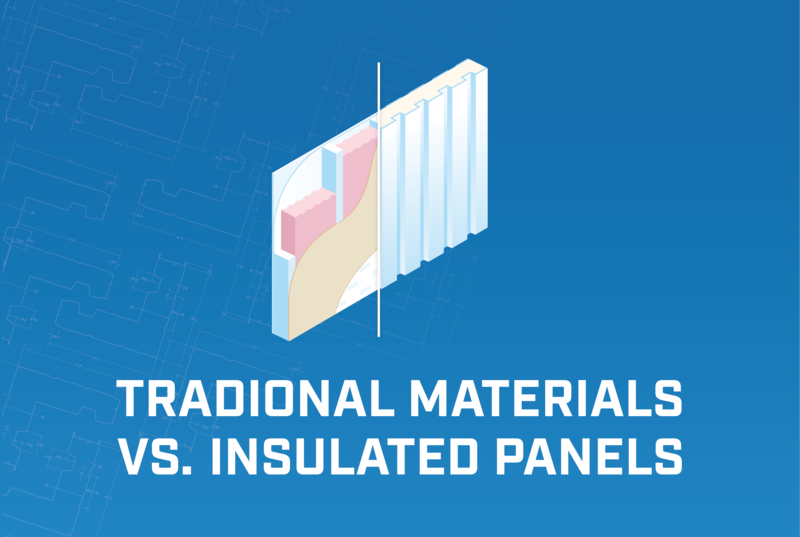 Let’s take a minute to explore the difference between insulated metal panels and those used in a traditional build. Most people are familiar with the process of the traditional build. This process includes multiple steps to get a project on the right path. Framing, insulating, and siding all take time to install, not to mention it can mean hiring additional trades to come in and complete one of the jobs. Not only does this add time to a project, but this process can be lengthy to get everything to the point of completion. All of these steps could mean a later finish date then originally expected setting you back before you even started. A lot of planning and research is required with a traditional build to ensure you are picking products that will provide you with better results in the long run. Using insulated metal panels as your building material can cut down building time, by taking seven steps and rolling that into just one. These panels can take care of the frame, insulation, wrap, vapour barrier, sheathing, siding, and interior finish all in one easy step. Cutting out all of the additional steps required for traditional building materials, not only saves you time but it also saves you money in labour costs to complete your projects. Insulated metal panels are refinished and provide everything a building envelope needs to be structurally sound and insulated. These panels can be cut in a variety of lengths and pitches to make installation quicker and more efficient. If you are worried about energy efficiency, selecting to use insulated panels as your build material is the right choice. Insulated metal panels are designed to keep you warm in the winter and cool in the summer. Choosing to use metal panels for your commercial builds in place of the traditional materials can also help protect your business from fire with their flame resistant foam core. We live in the time where anything is available to us at the touch of a button. Waiting for things to happen is a thing of the past, but we are still waiting for projects to be completed before we can move forward with our busy lives. Artspan has made building a commercial or residential property a quick and painless experience that will provide you with a long lasting, structurally sound building that will stand the test of time. We’d love to sit down with you and discuss your next build to see how Artspan insulated panels could transform your next project.